(and I am not referring to the cute Disney Movie). The concept occurred to my while I was reading (another) article on how Millennials are so different than other generations. The article highlighted some stats and insights which have become cliched categorizations at this point. You probably can guess them, therefore there is really no point listing them here. I would classify the article as outside in. Obviously anyone could argue every generation is different. The reality is generations may be more alike when looking from the inside out. Now, I am not suggesting that all Boomers are like Millennials. No way, a categorical generalization like that would be ridiculous. I am suggesting that there is a horizontal thread going through all generations. This thread is a common mindset driving their purchase decisions. This shopper mindset is a preferred state when shopping. One mindset threading through all generations is a Deal Seeker mindset. The Deal Seeker mindset explains why some people will expend significant effort to get a deal, while others will buy the first product they see in the store (also known as a Price Blind mindset). The following diagram shows an example of a Deal Seeker mindset across three categories: quick serve restaurants, hotels, and mobile phones. You’ll notice from the example there is a thread of Deal Seekers running through every generation. This thread represents at least 40% of generational shoppers in each category example. 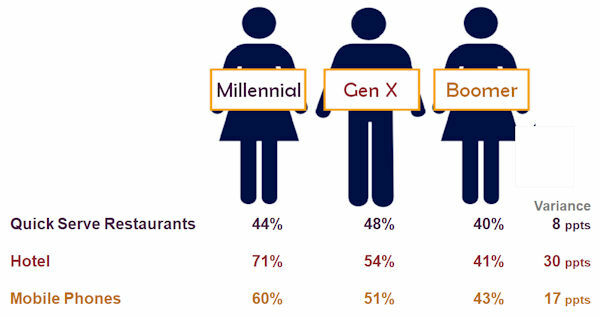 Worth noting is why the quick serve restaurant percentages are all lower than the other two categories (I know it seems a bit counter intuitive). Keep in mind deal seeking is defined by the effort exerted by the shopper. In hotels and mobile phones (both high consideration), a deal seeking shopper could expend significant effort searching multiple sources and/or retailers to find the best deal. On the other hand, quick serve restaurants tend to focus on the deal. For these shoppers, much less effort is needed to find a deal, because it is regularly communicated through a brand’s marketing. Now here is where there is a difference . A Millennial Deal Seeker may act different behaviorally than a Boomer Deal Seeker. Think about grocery shopping. The Millennial shopper may focus online to find their deals through deals sites, social forums, and grocer brand sites. The Boomer Deal Seeker may use circulars and conversations with friends and family to find their best deals. The mindset is the same, however, how they exert their effort may be different. So what does an inside out marketer behave? Inside Out marketers first focus creating content that will move the shopper. They understand how promotions like BOGO and “10 for 10” drive action. They understand the effectiveness of limited availability or limited time offer. They understand it is about a the shopper’s perspective of the “deal” (not just the price), which equates to a relevant valuation of the price paid to product quality Oh yeah, and they also understand the competitive landscape and how other marketers are communicating to the same shoppers (e.g., is their deal, truly a deal, or just a part of category white noise). Secondly, Inside Out marketers understand the sources which influence the shopper based on their shopping behaviors. These may be different by generation. Keep in mind, this isn’t limited to the brand communication. An inside out marketer understands the shopper’s deal ecosystem in deciding where to go and what to buy. An example of a non-brand channel is word of mouth. A marketers goal is to fuel customer to spread the deal, whether it is through a person’s social media network or old school conversations with friends and family. In conclusion, next time your are reading an article about Millennials. Gen Z, or any other generation, I challenge you to look deeper. To look inside to understand what is truly driving their behavior, then ask yourself is this truly unique to the generation or is it a thread through all of us.